It’s nice having someone as powerful as J.K. Rowling on your side. It’s nice having someone as powerful as J.K. Rowling on your side, going up against the anti-Semites. She deserves more medals for sticking up for us! Her new role of putting the alt-right and others in place for their antisemitic remarks reminds me of the great heroes who helped hide Jewish families throughout the Holocaust. This is a good example of how great people cannot be herded along with the rest of the sheep, and are not afraid to speak their mind. Understanding this on a deeper level is the key to understanding her exceptional success as an author. Even though her life wasn’t ideal at the time, J.K. Rowling managed to tap into her inner self and bring to life what she discovered there. 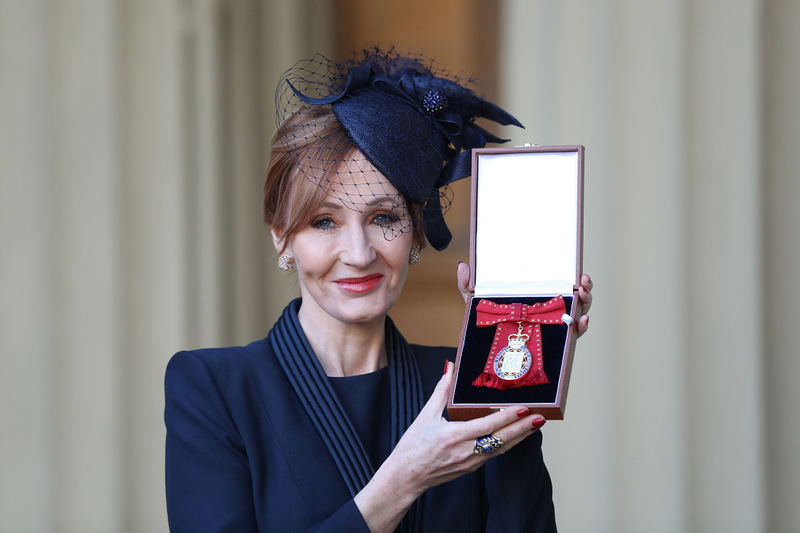 She introduced youngsters of all ages to a magical existence where they have special powers to overcome evil, and by doing so highlighted how we all have a choice at any given moment to do the right thing. Harry Potter is a fantasy world of course, but what we are currently dealing with in society is an ideological war between the good forces that are trying to bring people closer together, and the evil forces that are constantly adding more hate to the fire. The Harry Potter series hints at our future state where we really have super-human powers that allow us to be better human beings. The truth is that we all have the potential to become wizards when it comes to upgrading how we treat the people around us. J.K. Rowling has given millions the sensation that there is something more to be discovered beyond our current existence. Her work gives generations of youngsters the promise that they can tap into their innermost and unique self, and impact the world in a very profound and positive way. We all have special powers that remain latent until we have the desire to activate them. The fact that her young characters could influence affairs in such a significant way kept us all glued to the series for all these years. What would I like J.K. Rowling to know? That there is a special language in the world, the first language that ever existed, which contains the code for kindness. In the ancient times of Babylon, there was only one spoken language and that was Hebrew. Before the human ego began growing, people got along and helped one another. They spoke a single language and understood each other perfectly. The whole world doesn’t need to go back to speaking Hebrew, but humanity as a whole does need an entirely new set of tools for getting along here together in peace. And that new education can only come from Israel. When Israel begins to share this insight with the world, it is written in the holy sources how our enemies will take us on their shoulders to Jerusalem. The natural system drives all of human society towards a central pressure point — demanding the Jewish people to unite in order to fulfill their spiritual duty. To do that, the Jews were given the method of connection — the wisdom of Kabbalah, which can help them become a model for all nations. The popularity of Harry Potter reflects the desire for something beyond what we can find in this world. The explosion of interest in New Age religions, mysticism and Eastern philosophies also points to the growing need young people feel to find meaning in life. In order to help our children, we must let them know that there is a reason for the emptiness and confusion that they feel. We need to show them where they fit into humanity’s general course of development — and let them see that they represent the final phase in the evolution of desires. And we have to provide them with a way to develop and fulfill their desires. Kabbalah can help us provide such guidance by giving youth a tangible understanding of the purpose of their existence. And once our children know what their purpose is, they will be motivated to go after it. Apathy, anger, depression and despair will give way to the same passionate energy with which their parents and grandparents pursued the “American dream” — the quest for money, honor and fame. Our children will be able to go places and achieve states of unbounded happiness, but we must provide them with the tools and guidance for their journey. By so doing, we will save them a lot of misery, allow them to find true happiness, and hasten everyone’s way towards the true purpose of existence. There are many complicated concepts to absorb in this post, but what it all comes down to is a connection method that anyone in the world can experience. Jesse Bogner is a millennial New Yorker author who was also in a very tough spot in life, when his father asked him to go over some of Michael Laitman’s texts for a book. That was the turning point in his life. Jesse moved to Israel and in a few short years, has transformed from being a negative element in society, to being an extremely positive and contributing part of society. The only choice we really have in life, is whether we want to remain in our egoistic cocoon and only think about ourselves. Or if we’re ready to come out of ourselves and begin practicing a superior kind of existence. Clearly this egoistic existence is not making us very happy. Imagine if we could create a magical environment of wizards who compete at doing more for others. Imagine if we woke up tomorrow in a world like that, and know that it is completely within our reach. If we haven’t come to this yet, circumstances in life will eventually push us to think about why we were put here and what our true role is. This doesn’t come naturally to any of us, but our entire evolution is geared toward helping us reach this critical point in our development. Ad campaign my father was photographed for by his famous father growing up in London. His father, Karl Schenker, escaped Nazi Germany in the 1930s. Something pushed my British father to move our family to Israel in 1978. Part of it was because his business suffered when a culture war broke out in Quebec and all the Jews moved to Toronto. His upbringing in the shadow of the Holocaust and his famous father escaping Nazi Germany probably also had something to do with us moving to Israel. Israel is much more than a piece of land. It is the spiritual center of the world. Hopefully soon we will start acting that way and fulfill our spiritual mission.